30 Nov Meteors MiniRoos enjoy Socceriffic success! 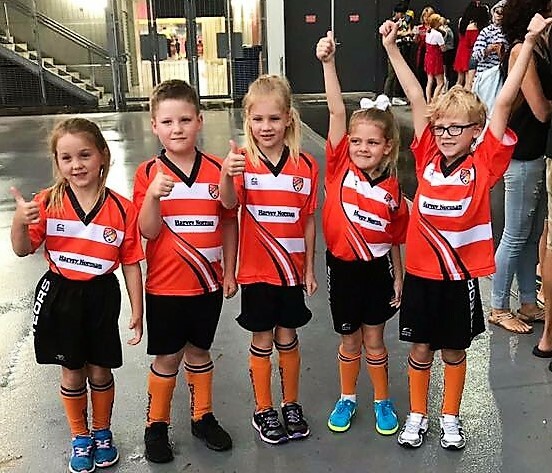 Five Meteors’ Football Club Aldi MiniRoo’s travelled to Brisbane last week to represent their club and play during half time of an international soccer match. Donna said that Sophie and the team then went on to play a game at half time. The children’s Coach Hannah and Mark Delaney from CQ Mariners were on hand to guide the soccer stars through their special match. “The smile on the children’s faces when they came off the field was brilliant to see,” Donna said. The Aldi MiniRoo program is the official FFA home of football for boys and girls of all abilities, aged between 4 – 11 years old. ALDI MiniRoos aims to introduce Australia’s biggest junior participation sport to newcomers in an inclusive way. Donna said the Mini Roo program had been delivered at the Metoers Club this year and next season they have plans to extend the program and increase team numbers for 2019. Donna said the Gladstone based Meteors team had enjoyed a fantastic football season this year. Both ladies teams had won the finals and the men’s team had finished their in their competition. “The Club is always on the lookout for new coaches, members and sponsors,” Donna explained. “The club will be holding an informal meeting on Friday November 30th to discuss plans for next season and elect any new coaches and committee members. We welcome anyone who would be interested in taking a role or volunteering,” she added.